Was my invite lost in the mail? Sorry to veer off again about the Real Housewives but much like last time, this is semi on topic as its about renovation. I'm highly offended that I never received an invite to the McCord-Van Kempens House Party! Perhaps it was lost in the mail? Or maybe it because I am no one important and they don't know I exist? Nah, lets go with the lost in the mail thing. Thankfully at least two other (much cooler than me) Brooklyn bloggers were invited and they shared their photos. Those two lucky bastards were Mr. Brownstoner and Cobble Hill Blog. First off, I'm going to say right now that these are some really bad photos. I mean, come on people. Turn off the flash at least! Now if only the post office hadn't botched up my invitation delivery, I would have much better photos to share with you. And if by chance Alex & Simon just didn't invite me outright, they really did their home a disservice by allowing it to be photographed this way. But moving on from this social injustice - I will say that it wasn't really my taste but I imagine they would equally hate what I've done to my house. I'm a little suprised they didn't pick more fashionable styles like super modern or mid century modern. All that said, I think their living room is least bothersome to me because it looks pulled together. Even if its not a final product I would want to live with, they clearly love it! They thought through their choices carefully and it has a lot of personality. 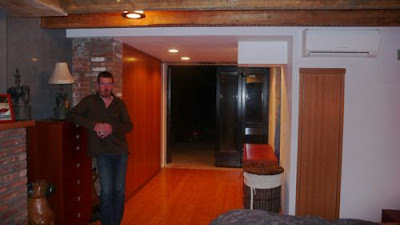 But the rest of the rooms look a little bit thrown together without much thought. That bothers me a lot more. That doesn't seem to suit them either- or at least the "them" that I know from the television show. Who else was watching? What did you think? While I applaud them for a unique style there are some things that really bother me: The tiny art on the walls (except that giant poster of Alice Cooper. Alice Cooper? That's what teenagers put on the wall in the 70s). The band of grey/blue on the moldings amongst the red and black looks as if they haven't finished painting yet. The chandelier with the wobbly shades and the non-red sofa. And the furniture placement. That's a lot, isn't it? 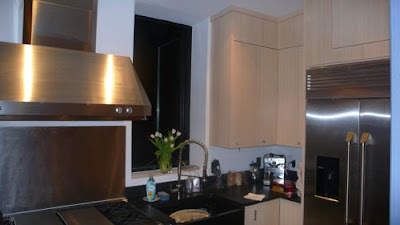 One more: The kitchen cabinets look so generic...and 90s to boot. I was just going to mention the Alice Cooper poster, while its not my taste it looks great with all the black and red going on. At least they are not living in the mess they were before, anythig is better than that! They should be reprimanded for their furniture placement in the living room. It makes little sense to put a chair in front of a fireplace. While better than the mess they had previously, it is still a mess in the sense that they didn't hire someone that has design knowledge to pull it all together. I don't understand the purpose of that teeny little picture between the two windows in the living room. It looks so lonely and out of place up there. I think they tried too hard to put together a home that people would think was edgy, contemporary and cool and ended up losing their own style in the process. I think they have a finished home. Finally. I'm not wild about the red walls, but they did a pretty good job in general. And Jill paid quite a bit more for a less than satisfying result. From these photos, the living room makes no sense to me. It looks like a dark cave where I'd be tripping over things all the time (random and not cohesive things, furniture-wise). And I agree with modernmama, the blue-gray moldings don't help at all. Maybe I am turning into my father, but the words Victorian Bordello did cross my mind. I could NOT wait until you blogged about their house. It is TERRIBLE! But I have to say, it 'looks' just like them. There are no words to say how bad I think it is. And what about the Bethenny/Kelly talk in the bedroom? That Kelly is CRAZY! Had i not known better, I would have thought those were the, "before," pictures. I give props to anyone who's willing to open their home to cameras and thusly, criticism. That said, I watched it on the show Tuesday night and I didn't "hate it" it's not my cup of tea but I didn't recoil. Yesterday I saw Mr. B's pics on Brownstoner and I didn't even think it was the same home. TERRIBLE PHOTOS! Simon even came online to put in his two cents. Bless him! Did you happen to catch Marty lurking in the background? That man will go to the opening of a can of soup! I am still laughing while reading your post. I would say it certainly is not my taste, but one heck of an improvement than what they had before. I think I was a little surprised because I had honestly thought they were more minimalist. Anyhow, this is still my favorite show! Really need to get back to watching this show! I really dislike the red! There is just too much of it!! wow - those photos are bad! You totally should have gotten an invite! I hated it too. It really surprised me. I honestly don't think they have much taste [seriously does anyone french braid their hair and tuck it under anymore? I thought that went out in the 90's]. And I agree, the house does not look pulled together well. I want to see their bedroom. And the kids' rooms. I can't believe they only showed the 1st floor. I'm assuming they ran out of money and couldn't decorate the rest of the place. I thought about you the WHOLE time I was watching this episode. I had a feeling you'd blog about it. It's not my style but if they are happy, that's all that matters. I'm not a fan of the makeover. I think they should have lived in the crap hole a bit longer and saved up more money. The red room seems out of place in that house. And it's too much. It really needs a third color to lighten things up. I hate the dark molding... is it black? Eww. And I ditto everything the first commenter said. hate the small photo on the wall. The sofa that doesn't belong. It's bad. I really, really dislike their decor. But, maybe it suits their personalities. I'm glad I am not the only one who thinks Kelly is crazy. 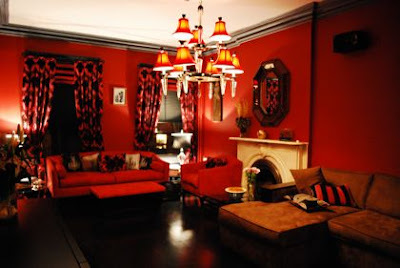 Exactly as I pictured, red, devilish, lounge-like, looks like a hot spot to raise a family. eeek, not.  You need to become friends with them, Mrs. Limestone! PLEASE. Not my taste and definitely not "family friendly" in my opinion but eh they have to live there not me right right? But since you asked I kinda felt like it was decorated in this manner just for the party. I mean the decor reminds me of a lounge/club not a space for the down home family get togethers.